TSM Central scheduling helps automate backup, archive, automatic client updates, and other processes. You can schedule IBM Tivoli Storage Manager operations by using an external scheduler or the built-in Tivoli Storage Manager scheduler. You can configure scheduling through Administrative command line or through TSM Operations Center (GUI). Tivoli Storage Manager administrators can create schedules to automate operations. Each scheduled operation is called and is tracked by the server and recorded in the database. Scheduled operations are recorded if they are in progress, are finished, or fail. You can query the log to determine whether the scheduled events finished successfully. You can delete event records from the database as needed to recover database space. If you have TSM Server in multiple time zones, schedules run in the time zone of the server. With TSM Central Scheduling, you can configure Client schedules and Admin schedules. Client schedules are use used to run all the client client activities like backup, restore, archive etc. Admin Schedules are used to run the TSM server internal process automatically such as reclamation, db backup expiration etc. The Tivoli Storage Manager central scheduler allows client operations to occur automatically at specified times. You should first understand the relevance of below parameters before configuring schedules. A definition on the Tivoli Storage Manager server which specifies critical properties of the automated activity including the type of action, the time the action should take place, and how frequently the action will take place. There are numerous other properties which can be set. An assignment to a specific schedule definition for a client node. Multiple schedule associations allow single schedule definitions to be used by many client nodes. Because schedule definitions are included with specific policy domains, it is only possible for nodes defined to a certain policy domain to be associated with schedules defined in that domain. A schedule definition must exist for a specific policy domain. A schedule association must exist for the required node which belongs to that policy domain. When creating a schedule definition on the Tivoli Storage Manager server, schedule actions that you can take include incremental, selective, archive, restore, retrieve, imagebackup, imagerestore, command, and macro. A schedule definition using the command action allows an operating system command or shell script to be executed. When automating tasks for Tivoli Storage Manager for Data Protection clients, you must use command action schedule definitions which invoke the command line utilities for the "TDP" application. The schedule startup window indicates the acceptable time period for a scheduled event to start. The startup window is defined by these schedule definition parameters: startdate, starttime, durunits, and duration. The startdate and starttime options define the beginning of the startup window for the very first scheduled event. The duration of the schedule window defines the length of the startup window. The schedule action is required to start within the startup window. You can also vary the start time window of the clients by using the randomization feature provided by the Tivoli Storage Manager central scheduler which helps to balance the load of scheduled sessions on the Tivoli Storage Manager server. The Tivoli Storage Manager server maintains records of scheduled events which can be helpful when managing Tivoli Storage Manager schedules on several client systems. The Tivoli Storage Manager server query event command allows an administrator to view event records on the Tivoli Storage Manager server. The command-line client and scheduler provide reliable, consistent, and documented return codes and also provide automation of client operations through user-written scripts. Administrators can distinguish between scheduled backups that finish successfully with no skipped files and scheduled backups that finish successfully with one or more skipped files. Also, if the prescheduled command ends with nonzero return codes, the scheduled event does not run. This ensures that scheduled events run only if prescheduled commands finish successfully. Below are the return codes you will see when an client schedule is configured and scheduled. The return codes tells you the status of the schedule. Return code 0 - Operation finishes successfully. Return code 4 - Operation finishes successfully, except for one or more skipped files. Return code 8 - Operation finishes with one or more warning messages issued. Return code 12 - Operation fails with one or more error messages, except for skipped files, issued. 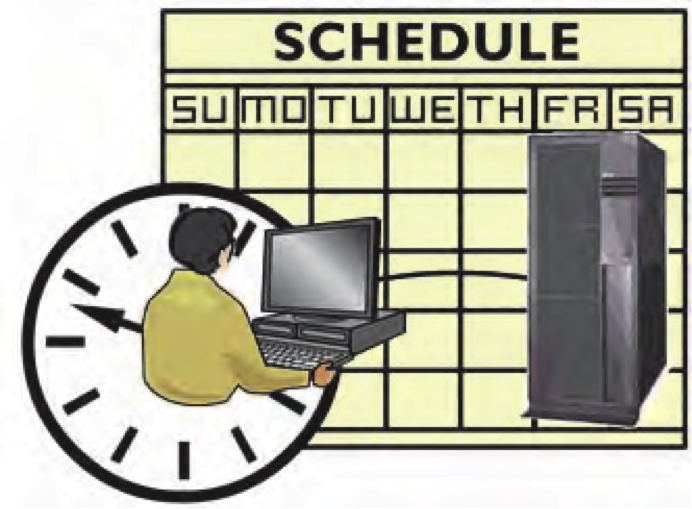 Based upon these return codes, you can conclude if the schedule is successful or failed. 0 Comment to "11.1 TSM Central Scheduling Overview"